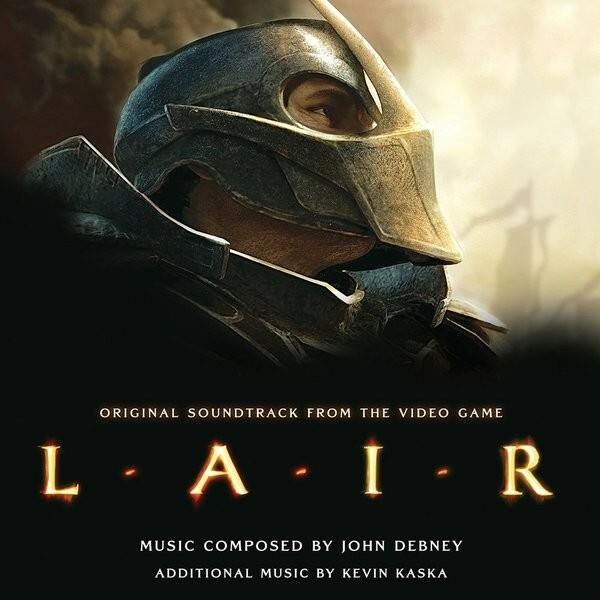 Music for video games and games in general has certainly come a long way, but for one of LA LA LAND records latest releases we go back to 2007, we are presented here with John Debney’s powerful and highly exuberant soundtrack for LAIR. Which was released by Sony and caused something of a stir among gamers worldwide. The composers sweeping score is released here in a 2 disc set and has nearly 2 hours of glorious music contained in a total of 39 tracks which is a far cry from the five track promo that was issued in 2007. 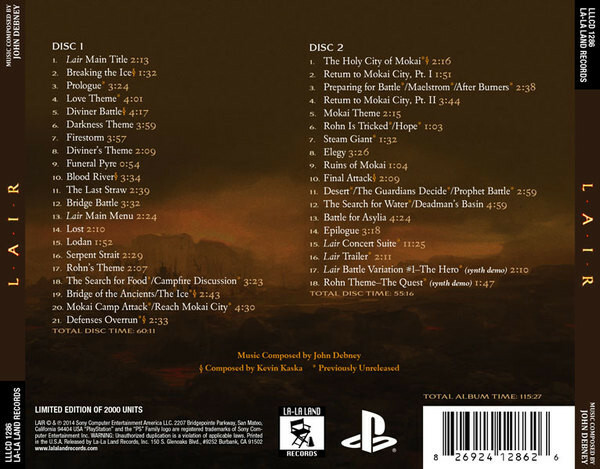 The thing that immediately strikes you when you begin to listen to the score is that it posses such power and drive, it is a vibrant and epic work that draws much from the works of John Williams and also at times Basil Poledouris especially his scores for The Conan movies and to a degree FLESH AND BLOOD. Large symphonic orchestra is utilized along with choir and some excellent female solo vocals courtesy of Lisbeth Scott that add an earthy and credible ethnic ambiance to the proceedings. Brass flourishes reminiscent of Williams STAR WARS soundtracks power the score onwards and sweeping strings add not only drama and fervour but also infuse a sense of romanticism to the work, personally apart from the obvious influences of Poledouris, Williams and Goldsmith there are also present nuances and interludes that can be likened to the epic film scores of Rozsa, Waxman and also Korngold. The composer employing bold and grand sounding thematic material that is filled with heroic and fervent flourishes, fanfares and crescendos and laced with numerous musical colours and layers to create a high octane soundtrack that is relentless and un-stoppable. To go into detail I think wont help, let us suffice to say that this is a score that you must own, it is adventurous, dramatic and full of highly effervescent themes. Presented to a high quality by La la Land records, with a informative booklet, disc two also contains the concert suite from LAIR which is also highly recommended. 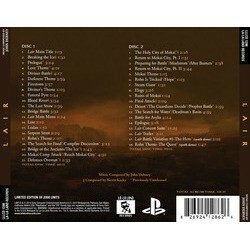 This is a must have soundtrack an essential purchase, just go and get it.